The heart has four chambers. The atria are the two upper chambers, while the ventricles are the two lower chambers. Whenever the heart beats, an electrical signal spreads through the heart, which makes the heart muscle contract. 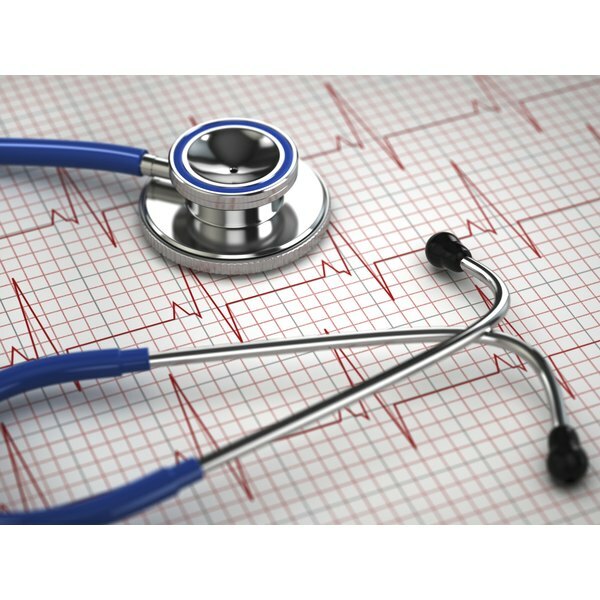 A heart that beats too slow or too fast, or has an irregular rhythm, is having an arrhythmia. A PVC is a type of arrhythmia. PVC stands for premature ventricular contraction, where the ventricle contracts earlier than normal. This results in an early heartbeat and one that is weaker than it normally would be because the ventricle did not get a chance to completely fill up with blood before contracting. The condition is very common and is even seen in people who do not have any signs of heart disease, according to Joseph Piktel, M.D. of the Department of Emergency at MetroHealth Medical Center in “Tintinalli’s Emergency Medicine.” PVCs are seen in most people who do have heart disease where an area of the heart is not getting enough oxygen. PVCs can be caused by a low amount of oxygen, but besides this occurring in heart disease, this can happen as a result of suffocation, near-drowning, an obstruction in the airway, a low volume of blood, a collapsed lung, or a blood clot in a blood vessel that is in the lung. In “Tintinalli’s Emergency Medicine,” Dr. Piktel writes that premature contractions can also be the result of a low amount of potassium in the bloodstream; a side effect of digoxin heart medication; and a side effect of certain medications that increase the blood pressure, such as phenylephrine, phentermine and methamphetamine. It can also be the result of low magnesium in the blood. In the June 2002 issue of the “British Medical Journal,” Corey Slovis and Richard Jenkins explained how a low amount of potassium in the bloodstream affects the heart, and that these changes will be seen on an electrocardiogram, or EKG. One abnormality seen on the EKG may be a premature ventricular contraction, especially if there is also a low amount of magnesium in the blood, not an excessive or high amount of magnesium. This is why magnesium sulfate is used as a treatment for PVCs, to lower their frequency. Magnesium sulfate is called an antiarrhythmic medication because it prevents abnormal rhythms, like PVCs, as it raises the amount of magnesium in the blood. According to the National Institutes of Health, premature ventricular contractions and premature atrial contractions are the No. 1 kind of arrhythmia, or the No. 1 type of heart abnormality where the heart has an irregular rhythm. As premature ventricular contractions can occur in people who do not have any heart disease, most of them are harmless and people who have them do not usually have any symptoms. In addition, most people will not even need any treatment. If you do have a PVC and have symptoms, you may feel a “flutter” in your chest.